Many people mistake a wallaby from a kangaroo and vice versa. But one thing is for sure; these lovely animals belong to the Marsupial family and carry their offspring in built-in pouches. And of course, they are the pride of Australia. In order to differentiate the kangaroo from wallaby, it would be best to take note of some special characteristics that are unique to each animal. The obvious difference between a kangaroo and a wallaby is their size. 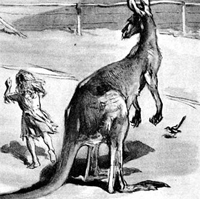 As a general rule, the kangaroo is much bigger than a wallaby. A kangaroo can grow up to 8 feet tall while the wallaby’s maximum growth is only 24 inches. So it is just natural that a kangaroo is heavier than the wallaby. A kangaroo can weigh up to 91 kilos but the wallaby will only weigh up to 24 kilos. Aside from size, the structure of the hind legs of these animals is also significantly different. The kangaroo’s knees and ankles are farther apart while the leg structure of wallaby is more compact. The legs of the kangaroo are designed for running fast on flat and open terrain. The compact legs of the wallaby, on the other hand, are built for agility to enable the animal to maneuver in densely forested areas. Kangaroo and wallaby have dissimilar body coat. The wallaby’s coat is flashier, brighter and has a distinct sheen. The wallaby’s coat also comes in three various colors. On the other hand, the kangaroo’s coat has subdued colors, usually brown or gray, and is more uniform. Kangaroo and wallaby belong to the same animal family but they also have their own unique characteristics. Just remember that a kangaroo is bigger and heavier while the wallaby is shorter, smaller, and lighter. You also have to note that a wallaby is more agile while the kangaroo is faster. Mabelle. "Difference Between Kangaroo and Wallaby." DifferenceBetween.net. May 19, 2011 < http://www.differencebetween.net/science/nature/difference-between-kangaroo-and-wallaby/ >.